This is the ultimate non-surgical rejuvenation treatment, consisting of a combination of botulinum toxin wrinkle relaxation injections (Botox®) plus multi-syringe facial contouring. The pioneering ‘liquid face lift’ approach is a complex and highly skilled procedure, for which Dr Kersh is extremely well-known. She has truly created an art of using fillers stealthily but effectively, in combination with anti-wrinkle toxin and skin polishing techniques. Her techniques are based on today’s scientific understanding of facial balance, as well as assessing and addressing your goals for your entire face and its structure, both harmoniously and in motion, rather than chasing isolated lines and wrinkles. General Health and well being, including the psychological impact of physical changes to face and body. Dr Kersh treats the face as a whole and not in isolated areas. This is one of the key aspects of successful treatments, and utilizes a combined use of fillers around the face to lift, contour and volumise, as well as anti-wrinkle treatments to relax and smooth skin texture. With the combined use of Ultherapy, Dermal fillers, Botulinum toxin and Silhouette Soft (SS) threads , the need for surgical facelift has declined . 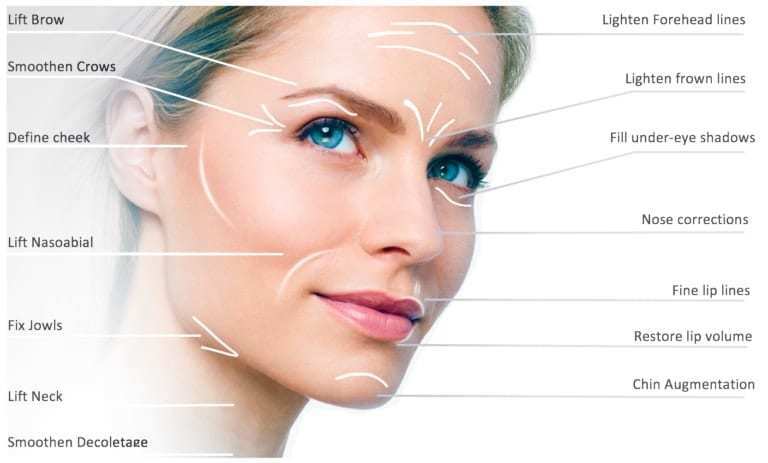 Following a careful assessment of our patient’s needs a treatment plan is composed aiming at progressive reversal of sagging and loss of volume symptoms .Ulthera is used to tighten and lift and promote the production of collagen followed by the use of SS threads or dermal fillers in combination with boltulinum toxin to achieve a lift and gentle rebalancing. Dr Kersh applies her 4-D approach with the 8-Point-Lift and MD codes to achieve a forward treatment plan. A Medical Assessment of your needs is also necessary to establish the health requirements of your skin. This will provide advice about diet and exercise, sun exposure and lifestyle changes, as well necessary vitamins, minerals and hormones necessary to keep you collagen healthy. Botulinum Toxin A works beneath the skin’s surface and targets the underlying muscle activity that causes frown lines, crow’s feet, jawline sagginess and nose tip drooping etc. The subtle and strategic use of Botulinum Toxin A can restore freshness to the upper face and tightness and lifting in the neck and jawline. Dermal Fillers are used to replace lost collagen, which causes volume loss. Botulinum toxin is used in combination with Dermal Fillers to reestablish natural plumpness and smoothness of the skin. Medical technologies are used in combination or alone to further enhance and rejuvenate the skin texture.